The Sergeant at Arms of the Senate or originally known as the Doorkeeper of the Senate from the First Congress until the Eighth Congress (April 7, 1789 – March 3, 1803) is the highest-ranking federal law enforcement officer in the Senate of the United States. One of the chief roles of the sergeant at arms is to hold the gavel used at every session. The sergeant at arms can also compel the attendance of an absent senator when ordered to do so by the Senate. With the Architect of the Capitol and the House Sergeant at Arms, he serves on the Capitol Police Board, responsible for security around the building. The sergeant at arms can, upon orders of the Senate, arrest and detain any person who violates Senate rules. The sergeant at arms is also the executive officer for the Senate and provides senators with computers, equipment, and repair and security services. In March 2014, Senate Majority Leader Harry Reid announced that Terrance W. Gainer was planning on retiring as Senate Sergeant at Arms, and would be replaced by Senate Deputy Sergeant at Arms Andrew B. Willison. On January 6, 2015, the Senate swore in the sergeant at arms for its current term, Frank J. Larkin. 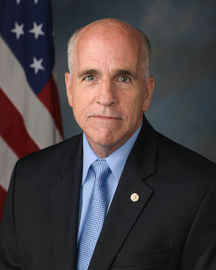 On April 16, 2018, after Frank J. Larkin retired, Michael C. Stenger was nominated as the 41st sergeant at arms under Senate Resolution 465, put forth by Senate Majority Leader Mitch McConnell. This resolution was submitted in the Senate, considered, and agreed to without amendment by unanimous consent. The office of the Sergeant at Arms of the Senate has between 800 and 900 staff, of the approximately 4,300 working for the Senate overall. Its budget is on the order of $200 million per year. Top officials reporting to the sergeant at arms include a deputy; a chief of staff; assistant sergeant at arms for intelligence and protective services; a CIO; an operations chief; Capitol operations; a general counsel; two legislative liaisons; and a CFO. The main office of the sergeant at arms is in the Postal Square Building in Washington, D.C. The core computer operations are in that building, and the staff manage Internet and intranet connections to offices of senators both in the Capitol complex and back in their home states. ^ a b "Sergeant at Arms". United States Senate. Retrieved January 9, 2015. ^ "Office of the Sergeant at Arms and Doorkeeper". United States Senate. Retrieved January 9, 2015. ^ "U.S. Senate: Sergeant At Arms". www.senate.gov. ^ "Sergeant at Arms". United States Senate. Retrieved January 9, 2015. ^ Berman, Russell (March 20, 2014). "Senate sergeant at arms to retire". ^ "Frank J. Larkin". United States Senate. Retrieved January 9, 2015. ^ Mitch, McConnell, (2018-04-16). "S.Res.465 - 115th Congress (2017-2018): A resolution electing Michael C. Stenger as Sergeant at Arms and Doorkeeper of the Senate". www.congress.gov. Retrieved 2018-09-13.